Burn MKV to DVD/ISO/DVD Folder/Blu-ray DVD on Windows 10/8/7. Edit videos before MKV to DVD conversion. Customize DVD template for MKV to DVD conversion. "How can you make a DVD player play .mkv files? What brands automatically reproduce these files?" "What is the best DVD player to play MKV files?" So many people have such puzzle right ? MKV is a popular container format which is used widely as it is easy to handle as well as use and features high-quality distribution of content. If you have downloaded an MKV video from the Internet or other sources and want to watch it using a DVD player, MKV to DVD conversion is needed. Majority of the DVD players available in the market does not support playing MKV format and thus you need to burn MKV to DVD. The conversion will also let you create a physical backup of your videos. To help you with all your queries on how to burn MKV to DVD, we have picked up the best solution as listed below. 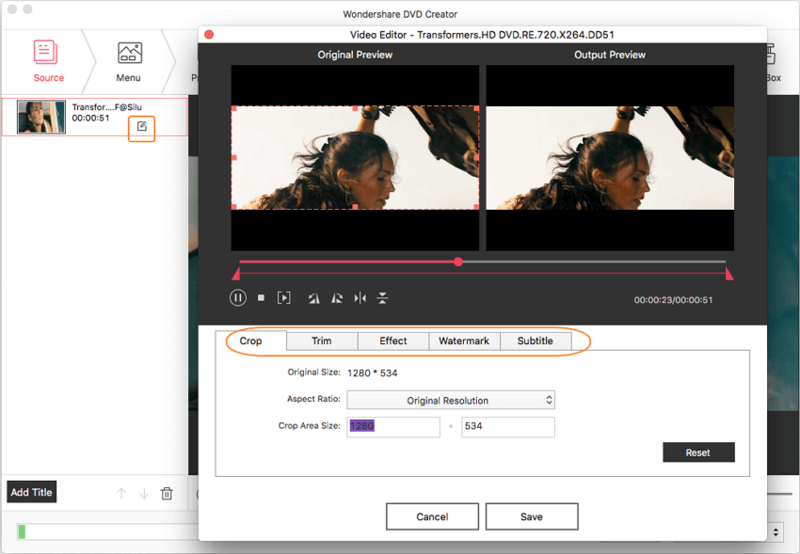 In order to convert MKV to DVD in good quality on your Mac system, a professional tool is needed and what can be a better choice than Wondershare DVD Creator for Mac(DVD Creator for Windows is also available). The software ensures that you get the best quality videos on your DVD disc without any hassles. In addition to MKV, all other major and popular formats like AVI, MP4, WMV, FLV, MOV, and others are supported for DVD conversion.
. Burn MKV, and other video formats from Mac, YouTube, Yahoo, Google, and others sites to DVD.
. Built-in video editor allows customizing videos before burning to disc. Features include trim, crop, adding special effects, rotate, and others.
. Select from more than 100 free DVD menu templates from Nature to Movie theme to make your DVD look amazing.
. Support DVD menu customization like changing background picture or music, adding text, editing thumbnail, creating chapters to your disc menu.
. Multiple videos can be added to a single DVD or a single video can be splitted into different sections.
. Additional toolbox help to realize functions such as Data Disc, ISO to DVD, Video Editor, Slideshow Maker, One-click to burn DVD, etc.
. Burn MKV to DVD on Mac or save as ISO files/DVD Folder with super fast speed and high quality output.
. Supported OS: Mac OS 10.14 (Mojave), 10.13 (High Sierra), 10.12, 10.11, 10.10, 10.9, 10.8, 10.7, 10.6, Windows 10/8/7. Step 1 Launch Wondershare MKV file to DVD converter and select new project. 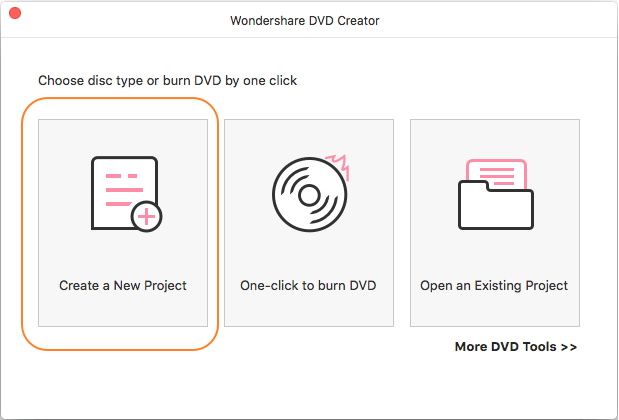 On your Mac system, download, install and open Wondershare DVD Creator and select Create a New Project in order to create a new DVD disc. Step 2 Add and Edit MKV videos for MKV to DVD conversion. 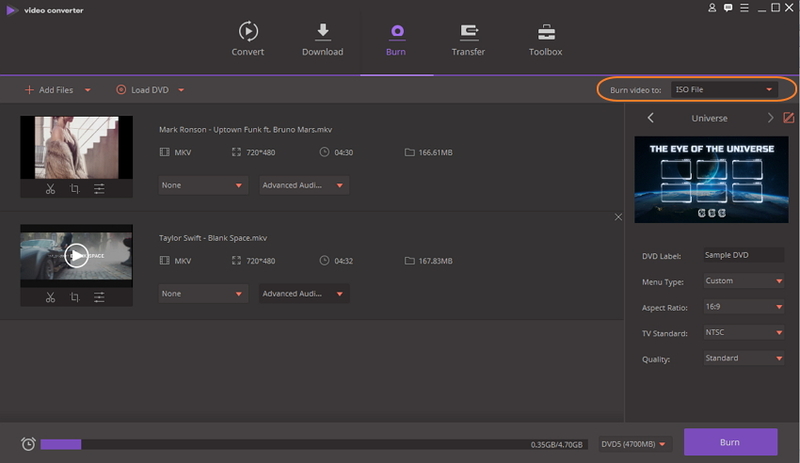 Hit the + sign on the program interface to browse and add MKV files from your Mac. Simply drag and drop files to the interface also works. Once the MKV files are added, they will appear as a thumbnail. To edit these videos before burning, click the pencil-like button to open Video Editor window, where allows you to crop, trim, rotate videos, apply effects, add watermarks, and others. Step 3 Select DVD Menu template and customize it. There are more than 100 animated and static DVD menu styles to choose from. Move to the Menu tab and choose your favorite DVD menu design from the right column. 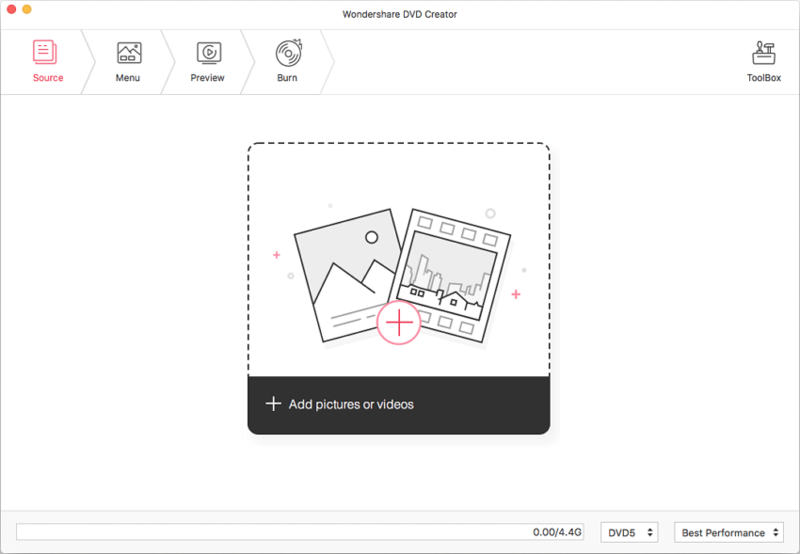 You can also customize the DVD template further, click the icons upon the display window, then you can change background pictures or music, add text, edit thumbnail, create chapters, and other functions. To know more DVD editing , you could click here to konw more. Step 4 Preview and burn MKV to DVD on Mac. Preview the created DVD by hitting the Preview button, back to the previous steps to make changes if you're not satisfied with your creation. Next, insert a blank disc into your Mac. Move to the Burn tab and select Burn to Disc option. 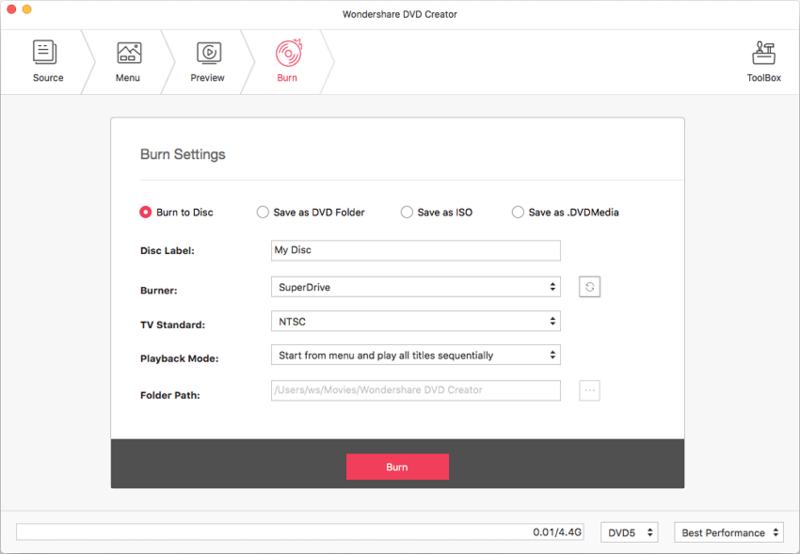 Finish Burn Settings including Disc Label, Burner, TV Standard, and others from the pop-up window, hit the Burn button to start MKV to DVD burning process. You can also save your MKV as DVD Folder, ISO files, and .DVDMedia as you like. • Professional software with quick burning speed and quality disc. • Over 100 DVD menu templates to choose from. • In-built video editor for customization. • Create chapters for a video easily. • Needs Software download and installation. 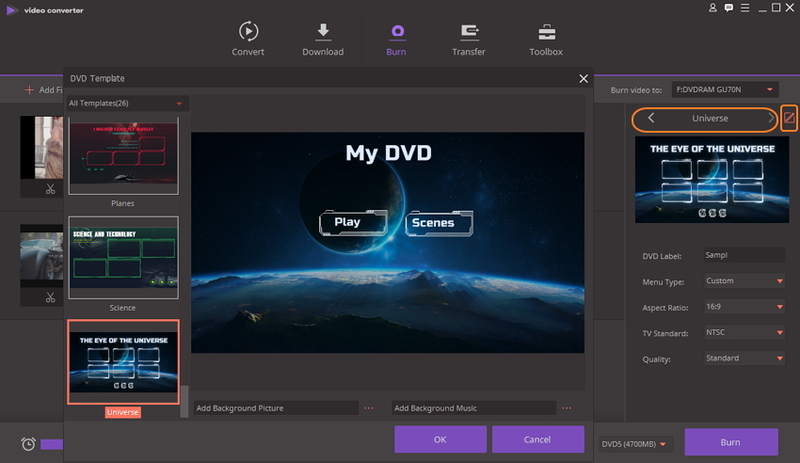 If you are not willing to spend on buying professional software and looking for a freeware with basic features to burn MKV to DVD , Freemake Video Converter proves to be a decent choice. This MKV to DVD free tool allows converting all types of MKV files to DVD disc in quick and simple steps. In addition to local files present on your PC, the software also allows burning online MKV videos. You can simply copy the YouTube video link to the program interface and burn it to a disc. Custom background to the DVD can also be added to make it look interesting. This MKV to DVD freeware also facilitates saving your MKV files as ISO file or a folder in case if you do have a blank DVD disc. Step 1: Download, install and open Freemake MKV to DVD converter free on your PC. Step 2: Click File > Video to browse and load MKV videos from your PC. Drag and drop function also works here. Step 3: From the available conversion options at the bottom panel of the interface, select “to DVD” format. Step 4: Set the disc specifications with respect to color encoding – NTSC, PAL. Film menu can also be selected if needed. Step 5: Prepare and insert the blank disc into your PC. Finally, convert DVD to MKV free by hitting the Burn button. • Free and simple to use software. • Support batch processing of multiple files at a time. • A limited list of supported formats. • No video editing option. • Limited customization features as compared to professional tools. If you are looking for software that not only burns your MKV and other formats to DVD, but also offers additional functions as well, then a complete video toolbox is needed. One such program that proves to be an all-in-one solution for all your video related need is Wondershare Video Converter Ultimate. Available for Windows and Mac system, the software proves to be the best MKV to DVD converter. When it comes to DVD burning, Video Converter Ultimate supports almost all formats and codecs. You can burn your videos to DVD as well as Blu-ray discs. The built-in video editor allows personalization with features like trim, crop, cut, and others. There are free DVD template designs available makes your disc look interesting. In addition to DVD burning, other supported features of the software include video conversion to all popular formats and specific devices, video editing with its complete editing toolbox, video download from more than 10,000 sites, Video transfer, and others. If needed, DVD MKV conversion is also supported. Download, and install the Wondershare Video Converter Ultimate software. Open the program on your PC. Select the Burn tab from the main interface. Click +Add Files to browse and add MKV videos present on your PC. Or you can drag and drop the files. Multiple files can be added at a time. Once files are added you can edit them by selecting edit icons present under the video thumbnail. Next, you need to select the DVD template. The designs available are shown on the right side of the panel. Move the right and the left arrow to check the designs. To check more template designs and to add background picture or music, click the Edit icon in the top-right corner. Enter desired DVD label and select settings of the disc with respect to Menu Type, Aspect ratio, TV Standard, and Quality. Step 4 Create DVD from MKV. At Burn video to:, select the location where you want to burn the MKV files. 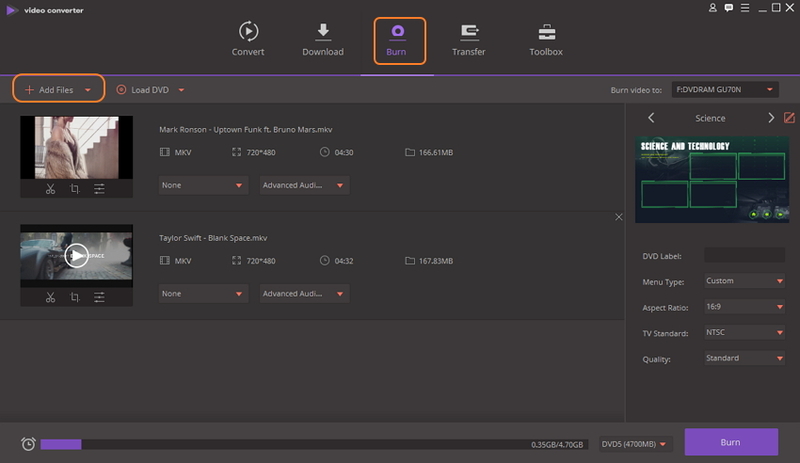 Finally, click Burn button to start with the process of burning MKV files to disc.
. Supports more than 1000 formats for DVD burning and conversion.
. Allows video download from more than 10,000 sites.
. Lossless quality video burning and conversion.
. Needs download and installation. In order to make MKV DVD process hassle-free and quick, listed below are useful tips. 1. Is MKV DVD player available? MKV is a popular format these days and a large number of videos on the internet also come in MKV format. However, you cannot play these files directly on a DVD player as only MPEG2 formats are supported by DVD players. So you need to convert MKV to DVD to make these files playable on your players. 2. How to Convert MKV to ISO? 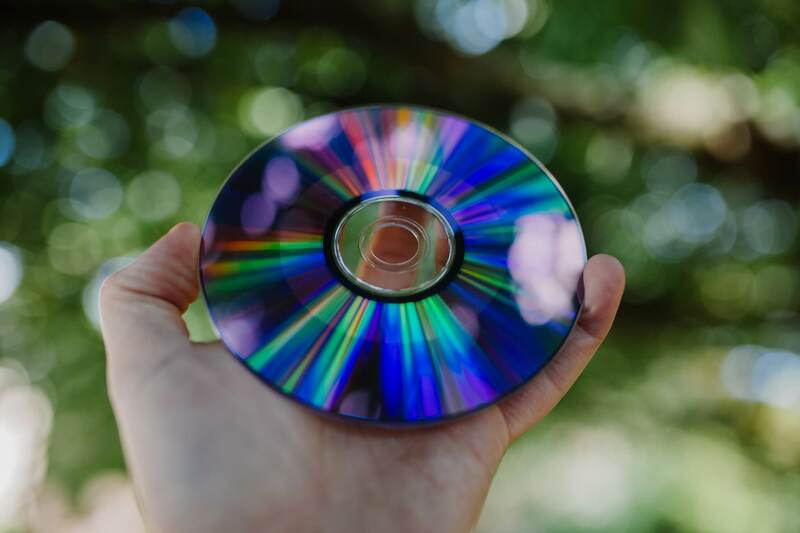 What if you do not have access to a blank DVD disc while converting your MKV files? No worries as you can convert MKV to ISO. 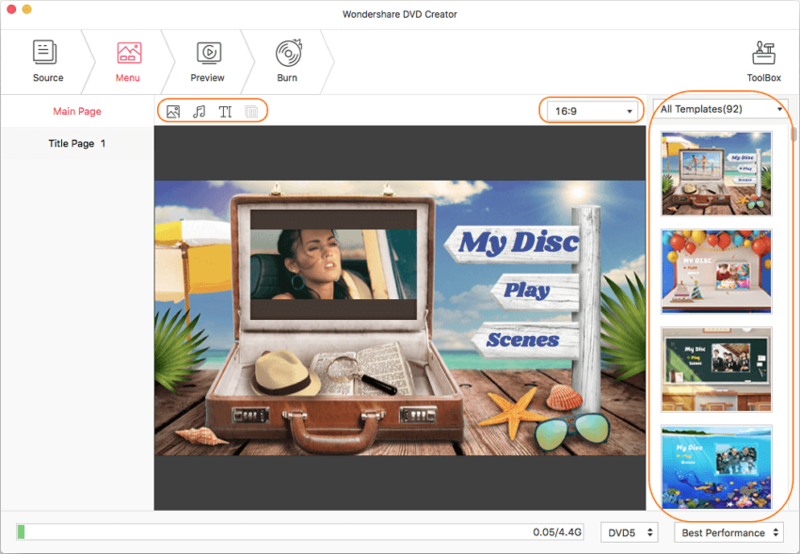 Wondershare DVD Creator is professional software that will assist you to convert MKV to DVD ISO in quick and simple steps. In addition to DVD, the software also supports MKV to Blu-ray ISO conversion. 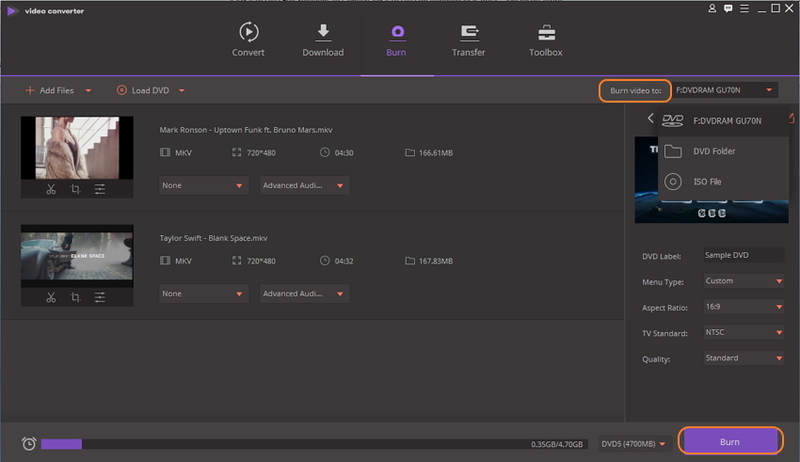 Add the MKV files to the software interface, edit videos if needed, select template, enter DVD label, and select ISO File as the location to burn your videos. 3. What features do you need to consider in the best DVD to MKV converter? While selecting an MKV to a DVD converter, there are a number of features that must be considered to have quality and hassle-free process. First of all, the converter should be able to deliver high-quality output and for this support of 4K and other high-quality MKV videos must be there. A professional program must have an option for DVD templates that can be customized as per your requirements. 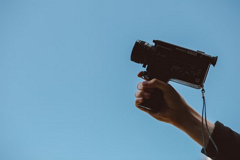 Editing tools make your video look professional and thus necessary feature to look for. There are a number of free as well as paid tools available to burn MKV to DVD Mac and Windows. The choice between free or paid entirely depends on your conversion requirements. If you have only a few MKV files that you need to burn to a DVD without any changes or customization then free software is a decent choice. But if you want to convert MKV file to DVD in excellent quality, with video editing, template customization, and other additional features then paid professional software is the best choice. There is a decent number of online tools also available that facilitates MKV to DVD conversion. These online programs need no download or installation and can be used directly from your browser. Moreover, the majority of these programs are free to use. But these tools are very basic in nature when it comes to features and functions. Moreover, the online tools majorly convert your MKV files to VOB (DVD supported format) without actual burning of DVD. So considering the features of different types of software and the tips listed above, it can be summed that professional software like Wondershare DVD Creator and Wondershare Video Converter Ultimate are the best options to convert MKV to DVD format. Get your MKV files converted into professional quality using the software.